I hope you had a great weekend! 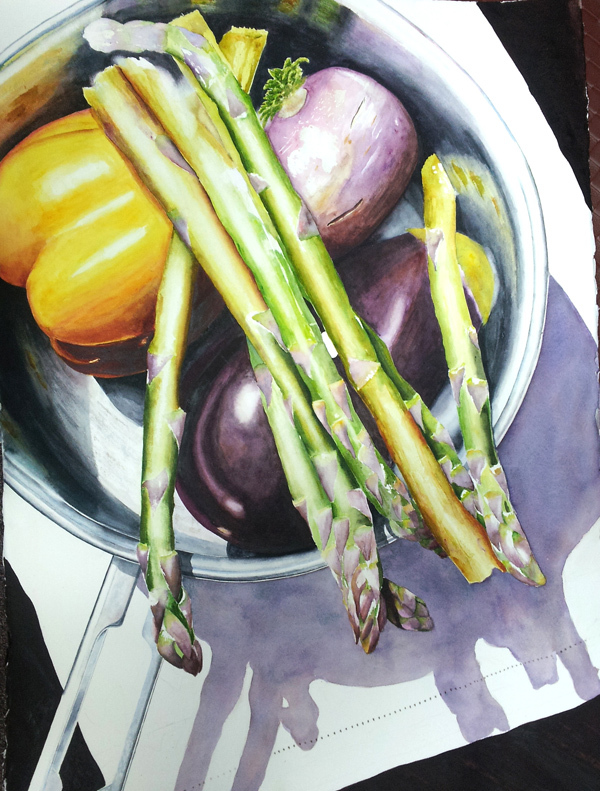 The painting of the vegetables has progressed a little but I don't have a new photo yet. I'm not happy with it so I need to study it for a few days to figure out what I need to do next. where the original photo was taken. 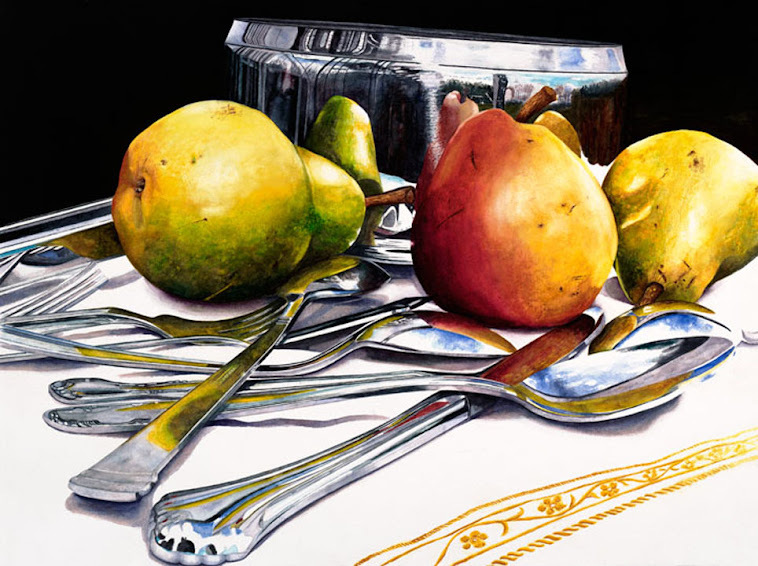 I thought of having an image made at Digital Arts Studio, http://www.digitalartsstudio.net, without the writing and then personalizing Giclees to the wine of one's choice. What are your thoughts on that? If you haven't been to Blackstock Winery in Dahlongea, it is really beautiful there expecially in the fall. On Saturdays they have lunch and live music. There are two other wineries on the same road and several more in Dahlongea. Great relaxed atmosphere and friendly staff. I've been thinking of my next series and am leaning toward Southern drinks, non-alcoholic like tea and lemonade and mimosas, margueritas, etc. Suggestions are appreciated! I've been working really hard to finish this painting this week but not so sure that I will be able to. There are a few problems with it that I'm working on. The table is too dark now but I'm happy with the big shadow I think. is even though they are still there. 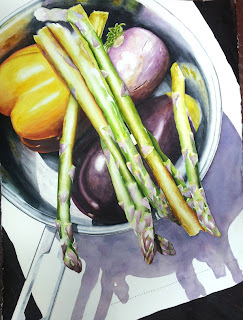 I got the asparagus too dark so I'm working on lightning it. There's still some work to be done on the pot. I painted the top of the eggplant after I took this picture and it looks a lot better now. The top picture is the most recent and it was taken with my phone so the quality is not as good as the other one. My new painting is progressing slowly. I had hoped to have it finished by now but haven't succeeded. I'm not sure my shadow is dark enough or the right colors. Comments are appreciated. Shadows really give me a lot of trouble. I keep thinking I will master them someday. I added the table top on the corners and I'm thinking of adding it to the upper right corner too. What do you think? The glow in the silver hasn't popped yet so I'm anxious to start working on it again this morning. Any suggestions for a name for the painting? I'm stumped. Also, I want to start or continue a series of paintings that reflect things of the South. My ideas so far are for a pitcher and glass of ice tea on a vintage cloth outside. Also, a lemonade one of the same. Any suggestions?? While painting yesterday, I got frustrated and finally just stopped. However, that was after 6 hours of painting so maybe it was time to stop. . It's cloudy and foggy today so it's a perfect day for me to paint. I love rainy days! So off to work I go, down through the muddy & cow paddie dotted pasture. Would you like to see pictures of my studio surrounded by pasture, cows and trees? I've started another full sheet watercolor painting. Although they are much more expensive to frame, I really love painting this size. 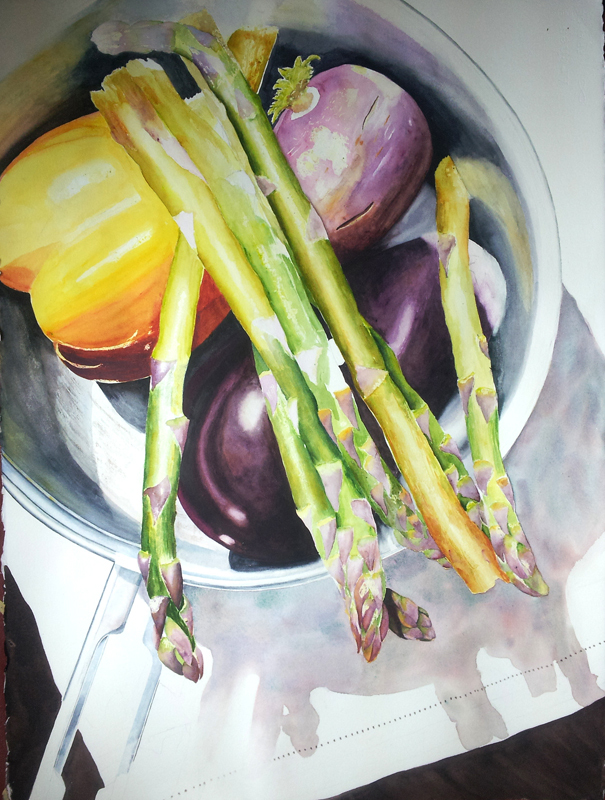 There are many collectors that prefer large paintings so maybe they will find my paintings irresistable! I'm really enjoying painting this so I hope it turns out well so that I can enter it in the next Southern Watercolor Society competition. I have clear contact paper covering the area around the pan to keep it clean. It's easy to use. Just pull off backing and press on painting. Use an exacto knife to cut around area that you want to paint and leave other areas covered. I haven't thought of a name yet so suggestions will be greatly appreciated.